Are you familiar with the “smiling curve” phenomenon? The details are provided here, but the short explanation is that a smiling curve depicts the value-add potential for each stage of an industry. For example, in the publishing space, you have three stages of content: creation, delivery and discovery. Those three stages are illustrated with a smiling curve here as part of a terrific article from Ben Thompson of Stratechery. Note the y-axis in that graph. It represents value, so the stages with points higher up the y-axis generally add more value to the overall ecosystem. That graph indicates two stages with high value-add (creation, discovery) and one with low value-add (delivery). Creation and discovery rank high because they’re capabilities that are extremely hard to copy. Sure, the self-publishing movement has resulted in a glut of authors, but how many are actually making money? How many have created a brand name for themselves they can leverage every time they release a new book? The graph indicates Google, Facebook and Twitter are some of the more well-known discovery players. Thompson’s article focuses mostly on the newspaper industry but if you add Amazon to the list of discovery players the piece applies just as well to book publishing. The key point is this: Publishers have considerably less industry and market leverage today than they did 20 years ago. Once upon a time book publishing was built around a scarcity model and publishers thrived. Digital disruption generally eliminates (most) scarcity. The resulting abundance completely destroys yesterday’s business models and forces most players to reinvent themselves to remain relevant. Those at the bottom of the smiling curve are at the mercy of those who rank higher on the y-axis. In his article Thompson suggests that AT&T is “trying to stave off their inevitable future as a dumb pipe between valuable content and valuable devices”. Sounds very similar to the position book publishers find themselves in today, doesn’t it? 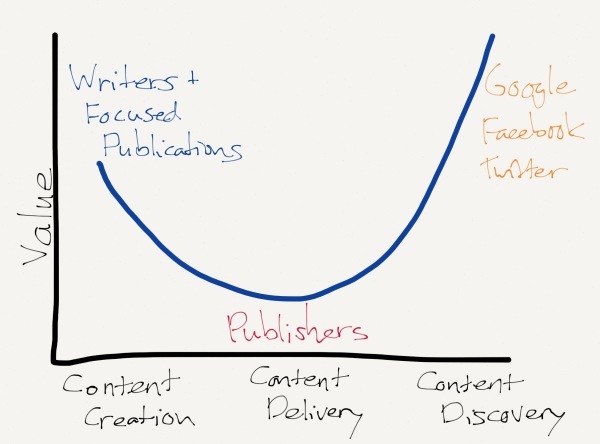 So how does a publisher climb out of the trough of the smiling curve? It’s easier said than done but I believe it comes down to publishers placing significantly more emphasis on what they do best. For example, has your organization truly distinguished itself by being the best at finding and nurturing new author talent in a particular topic area? What would have happened to those authors without your team’s discovery and development efforts? If you truly believe your organization was the game-changer for these authors then you need to emphasize that capability and make sure every new author in your space is aware of it. That’s one approach for dealing with the left side of the curve but what about the right side? If you’re wildly successful dealing with the left side you might not have to worry about the right side. But let’s face it. Most publishers aren’t really that great at the left side so they need to pay attention to the discovery element. Is it even possible for a publisher to play a significant role in discovery? Some publishers would suggest they rely on their channel partners (e.g., retailers) to take care of this. These same publishers have a marketing and PR team though. They all have websites and most of them tend to utilize social media and email marketing campaigns, so I’ve got to believe they want to play a role in discovery. The problem is most publishers only apply a half-hearted approach to discovery. They might even offer a full e-commerce solution on their site but then they wonder why nobody comes to buy. The problem is they don’t offer consumers a compelling reason to change their buying habits. It can be done though and I offered some advice in a recent article here. Most publishers desperately want to preserve yesterday’s scarcity-based business model but what they really need to do is acknowledge and embrace abundance, be willing to cannibalize yesterday’s revenue stream and focus on what really defines their brand for both authors and consumers. If you haven’t done so already, it’s time to read The Innovator’s Dilemma and think about how it applies to your business and the discovery challenge. The beauty of the web is that feedback for what I write here is spread across a variety of platforms. These days it seems most of those community discussions are happening on LinkedIn and that’s where some recent comments helped me see the common thread across a few different topics I’ve been writing about. A couple of weeks ago I noted how Nielsen data indicates a large chunk (49%) of ebook readers are also still buying print. In other words, almost half the reading community surveyed by Nielsen is straddling the fence between print and digital. Now think about the topic of last week’s article: Publishers are worried about whether or not they can change buyer behavior and attract consumers with a compelling D2C solution. As I mentioned in that piece, a successful D2C offering must include content and services a consumer can only find directly from the publisher, not via retailers. Instead of looking at digital and print as separate initiatives and consumer bases, it’s time for publishers to invest in digital companions to print products. What can you create digitally that makes the print reading experience more engaging? Think about companion apps for your most successful print products. More importantly, think about how you’ll deliver those apps directly to consumers. Here’s an example: I’m currently reading the legendary Gordie Howe’s autobiography, Mr. Hockey. I bought the e-version but this applies to print readers as well. I’m still in the early part of the book, learning about Gordie’s youth and curious to learn more about where he grew up and what that part of Canada looks like. I’m sure my curiosity will continue through the book as I read about the various youth hockey programs he dominated as well as his many years in the NHL and WHA. If I want to take a deeper dive into Gordie’s story most of it is only a few Google searches away. But why force readers to sift through piles of Google results in search of the most interesting nuggets? Why not have the editor or author provide their recommendations? Put those links in an app that I can open on my phone next to my tablet (or print edition of the book). Next, make it social. How many people reading this book saw Gordie play in person? Quite a few, I’ll bet. Many of them probably also have photos from those days they could quickly and easily contribute to the app, making it even more valuable for everyone. I’d love to see some previously unpublished shots of Gordie from the 1950’s or even the early WHA days. The app then evolves into a community product and becomes richer as time goes on and more readers contribute their memories. Next, and I realize Gordie isn’t in the best of health these days, but why not have the author make a cameo appearance in the app from time to time? Publicize a live chat with the author every so often and make sure that session is only accessible in the app. Record those sessions and maintain them in an archive area of the app. The companion described above is probably a freebie for everyone but I can envision some models where the app might cost 99 cents or even a few dollars. It all depends on the added value it offers. It’s a terrific promotional vehicle for the publisher and a way to establish a strong, meaningful direct relationship with consumers. Here’s the most important point: Make sure the digital companion is prominently featured in all versions of the book, including print and every flavor of e. It should be the first thing readers see when they open the book. A message like, “Thanks for buying this wonderful product. Be sure to visit our website to obtain the free companion we’ve created for it.” When they come, they register and are asked to opt into your marketing program(s). A strategy like this not only increases the value of the original book, it also helps publishers create that compelling D2C solution and converts indirect customers into direct ones. It may not work for every book but I’m convinced it’s a model worth pursuing for most titles, especially your bestsellers. Direct-to-consumer: Can you change buyer behavior? I recently visited a mid-size publisher to discuss direct-to-consumer (D2C) strategies with their sales and marketing leaders. Towards the end of the session I was asked the most important question of the day and it’s something publishers pursuing a D2C solution need to carefully assess: Can we really change buyer behavior? The point is that most consumers are trained to buy from Amazon. Further, those same consumers don’t want to bother with multiple bookshelves and accounts. Once you start buying from one ebook retailer you tend to stick with them. I’m an Amazon Prime member and that means Amazon is the first place I look to buy just about everything. Heck, we even “subscribe” to dog food on Amazon for our three basset hounds, so I’m a textbook example of a consumer who’s been trained by Bezos & Co.
My answer to the question was simple: No, you can’t change buyer behavior…unless you can truly offer a compelling reason for consumers to buy direct. Simply adding a shopping cart to your catalog pages won’t cut it. You’re also not going to make a dent trying to beat Amazon on pricing, so why create a race to the bottom? In order to change buyer behavior you’ve got to think about how you can offer something consumers won’t find anywhere else. I told this publisher’s sales and marketing leaders they need to envision a product assortment that showcases items not available on Amazon or any other retailer. I’m talking about short-form content that complements their books, video material that’s only offered on the publisher’s site, and yes, even some full-length ebooks that aren’t distributed through traditional retailer channels. Samples are another way of creating a compelling D2C solution. Publishers should super-size the samples they offer on their site. Make them longer than the ones consumers can get elsewhere and, when possible, add elements to make them richer as well. Timing of samples can also be leveraged. Why not make those samples available earlier and exclusively on the publisher’s website? One of the things that frustrates me about upcoming titles is how the sample isn’t available till the book publishes. Why? OK, I know the goal is to have a coordinated launch date so that title rankings will all benefit from a synchronized release. Fine, but let me grab the sample before publication and backorder the title so I don’t forget about it. Publishers, you should offer samples exclusively on your website a month or so before the book actually publishes. Attract consumers and train them to come to you for the sample, not the retailer. For publishers willing to acknowledge that digital rights management (DRM) only provides a false sense of security, sell your ebooks without this annoying limitation. Also, provide all formats to consumers when they buy direct (e.g., EPUB, mobi and PDF). Leverage services like Amazon’s “Send to Kindle” to push your D2C books onto the consumer’s Kindle bookshelf. Turn all these services into a club readers can join then focus on surprising and delighting them every step of the way. I admit this isn’t a model for all publishers. If your title list is wide and shallow, offering only one or two titles each on a large number of topics, you’ll never make this work. But if you cater to a particular genre or subject and your title list has plenty of depth you’ve already got the foundation for a compelling D2C solution. Also, don’t underestimate the amount of work it takes to build and maintain D2C momentum. You need to plan a steady stream of exclusive content offerings and services, just as a magazine publisher creates an editorial calendar. Don’t assume you flip a switch, offer a few exclusive items and you’re done. This requires an ongoing commitment of dedicated resources. If you’re one of those publishers with a deep foundational list you have two choices: You can either diversify your channel strategy by investing in a strong D2C model or you can sit back and let the big retailers determine your destiny. I strongly believe those who choose the former will be in a much better position to survive and thrive. Frankfurt Book Fair 2015 is in the rearview mirror but there were a few noteworthy tidbits gleaned from the event. Some of the more important facts and figures were shared by Nielsen’s Jonathan Stolper his state-of-the-U.S.-market presentation. Self-publishing and the Big Five are crowding out everyone else – According to Nielsen’s data, from Q1 2014 to Q1 2015, self-published books have grown from 14% to 18% of the overall market. In that same period the Big Five’s share has grown from 28% to 37%. Meanwhile, the rest of the market, all the large, medium and tiny publishers, have seen their share decrease from 58% to 45%. The print/e split is now roughly 74%/26% – Plenty of articles have been written about the plateauing ebook market. Most publishers report ebooks represent anywhere from 15% to 30% or so of total revenue. According to Nielsen, the current state of equilibrium is closer to a 74%/26% split. That ratio varies widely by genre, btw, but it’s worth looking at your own rate to see how it compares to the overall industry average. Price drives ebook interest – According to Nielsen’s consumer survey, almost 60% of respondents said they’d choose e over p if the savings is at least $4 for the former. Additionally, approximately 50% said they’d do the same even if the ebook is only $2-3 cheaper than the print version. So as publishers wrestle back consumer pricing via the new agency model, driving ebook prices up, it’s clear they’re inadvertently (and sometimes deliberately) nudging consumers back to print. Consumer prefer print and e, not or – 49% of consumers surveyed said they bought print and ebooks in the past 6 months vs. 42% who only bought print and a paltry 9% who only bought e. Just because a consumer buys ebooks doesn’t mean they’ve abandoned print. This is a huge opportunity most publishers are overlooking. Why aren’t there more digital products that complement print rather than assume the ebook is replacing the print one? Amazon dominates subscriptions too – It’s been hard to find data on the all-you-can-read ebook subscription market but Nielsen is finally shining some light on the model. And just as they do pretty much everywhere else, Amazon is crushing it. First of all, according to Nielsen only 5% of consumers have signed up for any ebook subscription solution, so the market remains small. Kindle Unlimited led the way with the largest chunk of market share, jumping from approximately 40% in January 2015 to almost 60% in April. Scribd and Oyster were tiny players by comparison in that period, and they’re only getting smaller. Given their teensy share of a small segment, it’s no wonder Oyster is going away soon. Btw, this was the first year for the Fair’s Business Club option and I hope it’s not the last. The Business Club was a terrific location for quiet meetings, away from the traffic and noise of the hall floors. It ranked high in serendipity value as well: I bumped into and met with at least a handful of other attendees I might not have crossed paths with otherwise. Highly recommended. When I meet with publishers I always ask them about the biggest problems they face in today’s market. One of the most popular answers is “discoverability.” Most publishers fret about getting lost in a sea of other books and promotional campaigns. Life seemed much easier in the brick-and-mortar days. A publisher simply paid a retailer for premium placement, resulting in endcap promotions and books stacked in high-traffic areas of the store. Those options still exist, of course, but they’re less important now that one retailer dominates distribution and discovery. That’s why I’m scratching my head about all the negative publisher and author reaction to the recent federal appeals court ruling on Google Books. If you’re not familiar with Google Books, it’s an extension of the search engine enabling discovery and sampling of digitized books. Many of those books are still protected by copyright, hence the delicate nature of the case. This is a preview. The total pages displayed will be limited. Pages 2 to 9 are not shown in this preview. In other words, what you’re seeing are merely snippets of the book. There’s no way you can read the entire work inside Google Books. What you can do, however, is search and discover more book content than you’ve ever been able to before. For example, on page 10 of the FDR book I noticed the phrase “Richard Crowninshield of Boston”. Let’s say you’re a researcher working on a project about Mr. Crowninshield. A colleague said they read something about him in a book but they don’t recall which one. You need that source because you want to buy the book to understand the context and your research requires more than just a page or two where the reference was made. I challenge you to find the book by searching that phrase on Amazon. I just did that and here are the search results. Smith’s book is nowhere to be found. Now search the same phrase in Google Books and here’s what you get. One click takes me directly to that page and the left side of the screen tells me Smith’s book is what I need. Notice that Google also includes links to buy the book as well, in print or ebook format. Publishers, wake up and realize that the largest search engine on the planet offers a powerful way for your content to be discovered and purchased. Rather than getting all litigious about this, why not embrace it and find a way to fully leverage it? The simple truth is that as technology evolves, the notion of “fair use” is also evolving. I think this is a very good thing, and not just for Google. History is littered with marketplace incumbents who crashed and burned as they tried to protect yesterday’s model. Tomorrow’s publishing leaders will be the ones who take advantage of services like Google Books, not those trying to make it go away in a courtroom.